I have nothing against burritos, but at the risk of calling out a brand on their Twitter usage this didn’t work…for me. Did it work for the brand in question? Perhaps, depending on their strategy – eg., we will engage/reply with designated hashtag “x” times per day (“though this be madness, yet there is method in’t”…) Yes, that’s admittedly a stretch, and a flawed one at that, but it’s the only one that comes to mind. – I had previously interacted with the brand in question, or at least made it known I was a fan. When does it work? Well, this one kind of did. 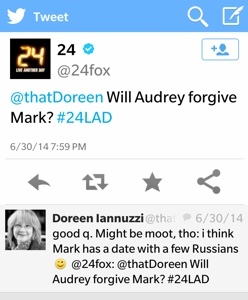 In this case, I had previously tweeted about Keifer Sutherland’s “24” and used their hashtag. Was their tweet to me meaningful? Did they retweet my reply back to them? Yes and no, but at least I noticed they were paying attention and aware that I was a fan, even though they were pushing out the same question to a bunch of their followers. 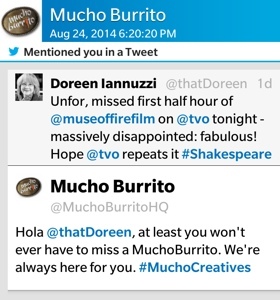 And, finally, for the love of Hamlet!, make your hashtags relevant – I can’t tell if #MuchoCreatives is a creative ad agency marketing burritos, a restaurant, or a burrito brand. Sure, in the final analysis you will rack up the number of hashtag mentions, but it will largely be a meaningless number. This entry was posted in brands, social media, twitter and tagged twitter, you're doing it wrong. Bookmark the permalink. I think so many brands have gotten past the early flush of so-me excitement (which is a very good thing), and have moved on to the stage where they’re trying to find the right weight to give it in the suite of marketing tactics. Unfortunately, in this stage, tactics get relegated to less experienced practitioners, and ham-handed executions like the one you shared (and it’s just one of a legion of similar examples from a variety of brands) become far too common. Senior staff spend more time looking at raw results data than daily implementation. Hopefully brands learn when folks like you share these examples and processes get reviewed as a result. It’s just like the lessons we learned when we first started building Web sites and blogs, and like our colleagues experienced in the days when other media were emerging.